A few years ago a Philly girl married a Southern boy she picked up online. Now she cooks a lot. And joined a CSA (Community Supported Agriculture). And bought WAY too much Tupperware, Pampered Chef, Le Crueset, Kitchenaid, Calphalon, and other kitchen toys. She started canning, just because she could. She likes to experiment in the kitchen. Here are her not-too-profound thoughts. 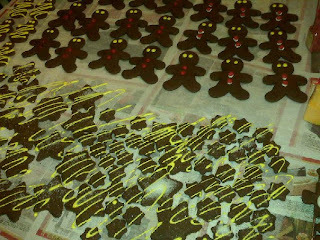 A wonderful icing for gingerbread cookies or cutout cookies. Left to dry overnight it will completely harden. Perfect as the "glue" for a gingerbread house or to attach decorations and sprinkles to cookies. I would NOT attempt this if my mixer was broken. Mix the powdered sugar into the egg white, vanilla and lemon juice about a cup at a time. Once somewhat combined, turn mixer to a high setting (using whisk attachment) and beat until stiff peaks stage. 1. Spread the thick mixture directly onto cookies. 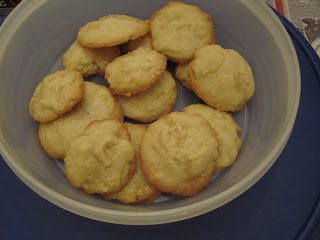 In electric mixer beat together butter and sugar until creamy. Add spices and salt and mix well. Add the baking soda mixture and molasses - beat for a while until thoroughly combined or until you reach the commercial break of the holiday special you are watching. Add the flour one cup at a time, then beat for two more minutes until well mixed. Let the dough stand while you go eat dinner or some other activity of your choice for about an hour. Place a piece of wax paper or parchment paper on the counter. Put about a third of the dough in the middle of the sheet, then rip another piece off of equal length to make a parchment-dough-parchment sandwich. Using a rolling pin, roll the dough out. Make sure to flip over your "sandwich" every minute or so. If the paper on either side starts to crinkle into cracks of the dough, carefully peel off the paper and lay it out flat and roll away. 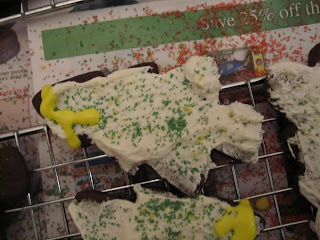 (Deep cracks will result in cracked cookies when baked). I think you are supposed to be getting the dough no greater than a quarter of an inch thick. If you ever figure out how to accomplish this, please let me know. Mine are probably 1/2 inch thick. Place the dough sandwich on a cookie tray in your refrigerator overnight, or lay it on top of the ice cream containers (or any items the same height) in your freezer for 20-30 minutes. Repeat with the remaning thirds of dough. Preheat oven to 350. Grease baking sheets. Remove a dough sandwich, which should now be cold and firm, from the fridge or freezer. Peel off the top layer of parchment, carefully flip it over so its is still sitting on parchment, and peel off the bottom layer. 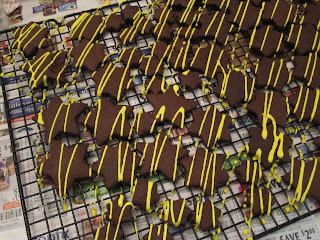 Now use whatever cookie cutters you like, and arrange cut cookies on a baking tray, no closer than 1.5 inches apart. 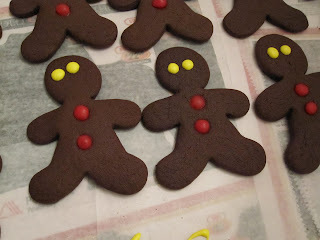 If you like you can add the hard cinnamon candies for gingerbread men buttons or raisins before baking. Reroll and refrigerate the scraps from between the cookie cutters. Because you are not rolling on flour, the chance of a tough and overworked dough from the scraps is much reduced. If you actually managed 1/4 inch thickness for your dough, then try baking for seven minutes. Mine were taking 10-12 per tray, depending on the size of the cookie. Remove to wire racks for cooling. 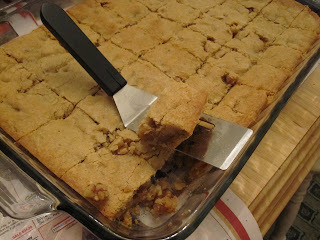 Drop batter by rounded tablespoons onto baking tray, spacing 3" apart. Bake for 12-15 minutes, or until golden on the edges. Transfer to wire racks to cool. For glaze: reduce 1/2 cup maple syrup by half. 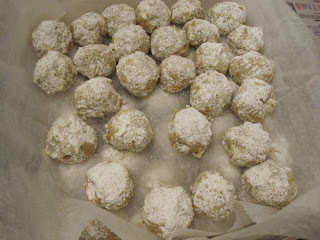 Drizzle over cookies, then sprinkle LIGHTLY with coarse salt. Allow glaze to harden overnight. Store in airtight containers. Butter a 13 x 9 pan. Pour melted butter into mixer, and add brown sugar. Cream until well mixed. Mix in eggs, vanilla, salt and rum. Add flour and beat until just combined. Add walnuts and mix until stirred in. Scrape batter into pan and spread with spatula until about evenly covering pan. Bake 25-30 minutes, or until done (like brownies be careful not to overbake - they'll set up a bit more as they cool). Cool completely before cutting, if you can wait. Sweet Jazmines, Berwyn - try the Sweet Potato Muffins!